Stuart Ross exists. Details follow. 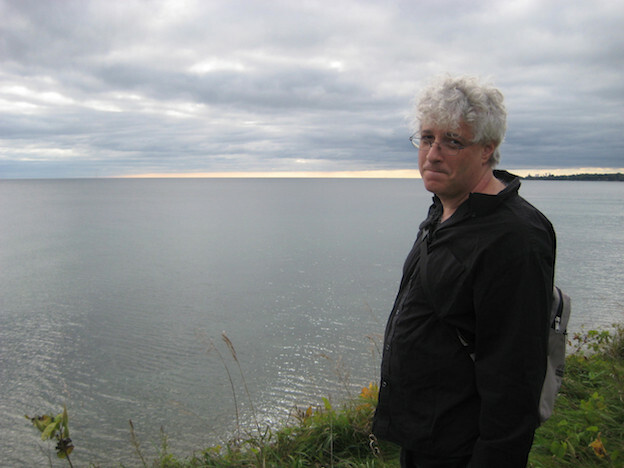 Stuart Ross at Lake Ontario (photograph by Laurie Siblock). Note: It has been many years since he stood on Yonge Street in Toronto wearing a “Writer Going to Hell: Buy My Books” sign (he sold 7,000 of his books this way in the ’80s), but Stuart Ross (b. 1959) continues to be an active and influential presence in the Canadian small press. I was planning to ask J. Gordon Faylor why he recently expanded Gauss PDF, historically an online-only press, to also making works avalable in print on demand (POD). When someone asked me at a poetry event (who was it?) what else I had on the docket for this column, and I listed Gauss, Chris Alexander informed me he was in the midst of an email exchange with Faylor about the very same question I had. Who knew?!? So I asked them if I could reproduce their conversation as an interview and, of course, they said yes. So here it is. If you’ve ever wondered what the enigmatic writer/producer/editor J. Gordon Faylor is up to (haven't we all?) here's a nice start at finding out. CA: Poking around the web, I see Gauss PDF described as “a website which publishes ‘digitally based works’ in pdf format (2010),” “an experiment in multimedia publication, having hosted everything from digital video and zip files to YouTube playlists and image collections” (2011), and a “poetry/non-poetry resource” (2012). When I look at the catalog, I see that your first two publications are PDFs, but already the third publication is an MP3 — followed by a ZIP file, and then a flurry of different formats: M4V, MOV, JPG, embeds from your Vimeo channel, and so forth. What was your vision for Gauss PDF when you started out in 2010? The first thing that I do whenever I go to a poetry conference or symposium is to make a beeline for the booktable. This is, admittedly, because I generally have a backpack full of my own wares which I’m hoping to flog off to the unwary, but my main motive is actually a strong desire to see what oddities and rarities the others have brought along. Far more of us than would care to admit it have a cupboard full of old back-issues of magazines and boxes of books from defunct small presses who have gone belly-up. Who else is going to be interested in such things except other writers? Librarians? Antiquarian book collectors? Academics? Funnily enough, I never seem to see any of them putting their hands in their pockets on such occasions. Manuel Brito, editor of Zasterle Press (Canary Islands) interviewed me for a special issue of Revista Canaria de Estudios Ingleses on "Small Press Publishing: Absorbing New Forms, Circulating New Ideas" (#62, April 2011). In his introduction, Brito writes: "
limited edition of 60 handbound copies.